Successfully Added 4.3 Inch Touchscreen MP4 player (8GB + TV OUT) to your Shopping Cart. If you're looking for an outstanding MP4 player that is packed with amazing features and looks stunningly cool then we believe you've found your perfect match! Experience... This hot multimedia player comes with a vibrant, crystal clear 4.3 inch touchscreen. It's like holding a mini theater in the palm of your hand. Let's say you're waiting at the doctor's office. Be bored no more with your 4.3 inch MP4 player! Let's say your husband left you and you're going around the world living out "Eat, Pray, Love". All those long plane rides, all those long train rides...let this remarkable 4.3 inch touchscreen MP4 player be your perfect traveling companion. ...Perfection This handsome multimedia player comes with 8GB of internal memory and a microSD card slot that supports TF cards up to 32GB capacity. That's 40GB of movie and music magic you have at hand! You can store over 50 movies or over 8000 songs or close to 100,000 photos on this darling of a audio video powerhouse. Best of all, this MP4 player plays today's hottest file formats like MKV, AVI, MP4, FLAC, APE, ACC, MP3, and OGG! 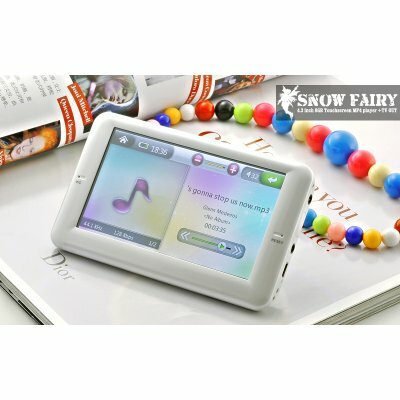 ...And More Great battery life, intuitive interface, plug and play convenience, and a whole bunch of extras makes this MP4 player the one to get if you want to be your nephew's favorite uncle or your secretary's favorite boss! Order today and we'll ship it out tomorrow. Brought to you by the web's online leader in direct from China wholesale electronics - Chinavasion! MKV, AVI, MP4, FLAC, APE, ACC, MP3, OGG, and more! Besides the factory direct budget price, this music and video file player is easy to use and plays a wide selection of popular music and video file types that is impossible to find in any other PMP on the market today. YES, this unit plays MPEG4 files, which usually have the file extension AVI or MP4. It also plays VOB, RMVB, and many other popular movie download file formats. i havent tried one myself but i've sold a few now on ebay and all customers have been very impressed and happy with their purchase. A couple showed freinds and referred them to me and they also purchased one. System stability, relability and build quality seems very good for the price. on 2011-03-17 09:04:50 It is overall very nice and very fast shipping. I love the theme and extras of this pmp. Everything works perfect and i really like it. Good product. It works fine. Good user interface.And also have transmiter function.